Recognizing the central role of embedded systems like ARM in the proliferation of the Internet of Things, I founded Azeria Labs to help people start prodding the security of ARM-based technologies and understand how to test the Internet of Things for critical vulnerabilities. The ARM Assembly Basics section of this site is meant for people who want to get the familiar with the ARM Assembly language. These tutorials do not require prior knowledge about the ARM platform and are a good starting point for future ARM reverse engineers or security researchers. The ARM Exploit Development section is for those who have enough knowledge about ARM assembly language and want to learn about vulnerability types and exploitation techniques. An introduction into ARM assembly basics covering the following topics: differences between Intel processor and ARM processor, how assembly works under the hood, and how to compile an ARM assembly program. Learn about ARM data types, the different types of ARM registers, and the usage of the CPSR (Current Program Status Register) in conditional execution. 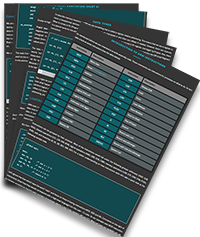 Learn about the differences between the ARM and Thumb instruction set and the most common instructions used for writing ARM assembly code. This chapter describes LDR/STR instructions covering three offset forms: Immediate value as the offset, Register as the offset, and Scaled register as the offset. This chapter describes how to Load and Store multiple values at once using the instructions LDM and STM. You will also learn how PUSH and POP are being used on ARM. Learn how to use condition codes for conditional execution in ARM and Thumb mode and how to use conditional branch instructions to jump to other functions. In this part we will look into a special memory region of the process called the Stack and explore how functions work on the ARM platform. This section is generally for those of you who are interested in exploit writing on the ARM platform. The ARM processor has become one of the most widespread CPU cores in the world. Which brings us to the fact that like PCs, IoT devices are susceptible to improper input validation abuse such as buffer overflows. Given the widespread usage of ARM based devices and the potential for misuse, attacks on these devices have become much more common. 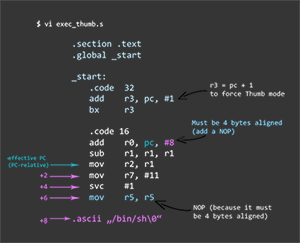 In the Exploit Development section of this website you will first learn what memory corruption vulnerabilities are and how to translate system functions into assembly and write your own custom shellcodes. The tutorial series will continue with more specific writeups on how to find and exploit vulnerabilities, so that you can start pondering the security and find critical flaws in ARM-based devices. Due to rapid increase of ARM based devices it is necessary to properly evaluate the security of such devices. One way of doing this is through direct exploitation of identified security issues. To do so one needs to be able to understand the basics of ARM Assembly language, know at least the most common vulnerabilities, be capable of writing exploits and flexible when it comes to adjusting the payload. Our site is intended to give the basic knowledge in these areas of ARM Exploit Development with a hope that the gained skills will be used for increasing the security of ARM devices that are out there. Learn how to trace system functions and how to use your knowledge about ARM assembly basics to write your first shellcode in ARM assembly. 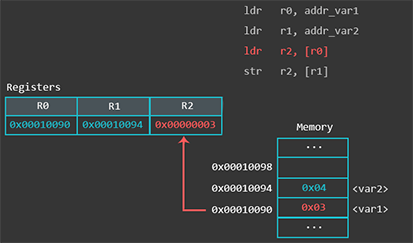 Learn how the memory layout of a process looks like and what memory corruptions are. This section covers Stack memory corruptions and Heap memory corruptions in more detail. Learn how to translate system functions into assembly and write TCP bind shellcode that is free of null bytes and can be used as shellcode for exploitation. These challenges are aimed at those of you who have no experience with reverse engineering or exploiting ARM binaries. They’re meant to introduce a few core concepts of binary exploitation.